Well, kittens, here’s your first real Oscar contender. 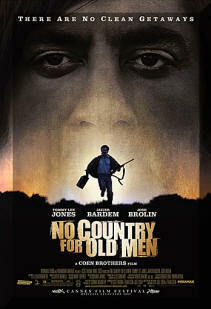 Unlike other films that seems to have been created with such a goal in mind (- Rendition, I’m looking at you), No Country for Old men is an effortless shoo-in for a nomination. Unlike many film fans, I don’t necessarily shake it at the Temple of Coen, but I have enjoyed many of their offerings Raising Arizona and Miller’s Crossing in particular. I was definitely a blank slate coming into the screening for their newest film. Based on the novel by Cormac McCarthy, No Country for Old Men is a study of human behaviour and its consequences. The difference between the realities we create in our lives to cope with the reality of life around us. The vast landscapes and small towns of the American southwest serves as a canvas for a mesmerising film that’s equal parts Greek tragedy, morality play and political statement. Under a parched desert sky, we find Llewelyn Moss, a silent, stoic blue-collar Texas man stalking a herd of deer. Wounding his quarry with a misplaced shot, Moss benevolently sets off to finish off the suffering animal, when he walks into a scene of utter chaos. Destroyed pickup trucks, bullet-ridden corpses of humans and pit bulls clue Moss into the fact that he’s walked into a drug deal gone horribly wrong. While searching for survivors, Moss discovers a suitcase of money and actually hesitates for a good couple of minutes before snatching it up and taking it for the answer of all his troubles and the promise of a better life for himself and his devoted wife, Carla Jean. Sadly, this is not a case of Finders Keepers and there are people who would very much appreciate the return of their earnings and to that end have dispatched someone to bring back the suitcase. Enter Anton Chigurh, judge, jury and executioner deciding the fates of those he comes across with the flip of a coin. Once begun on his goal of retrieving the money, no amount of begging or bargaining (- or bullet holes) will stay this psychopath from his appointed rounds. Absolutely unstained by doubt or human feeling, Chigurh pursues his prey armed with an air gun, like those used to dispatch cattle, which seems to be no more or less how he views his victims. In his utter emotionless, the nearly alien Chigurh is a nightmare in a Beatle haircut. Before even picking up Moss’s scent Chigurh has already left behind him a bloody trail of bodies. It is Chigurh’s murder of fellow officers which brings Sheriff Bell into the story. The last of three generations of lawmen and moments away from his own retirement, Bell’s belief in the law and the rightness of the world is called into question as never before as he becomes enmeshed in the cat and mouse game between Moss and Chigurh. The pointlessness of the murders and dissonance in the world around him has thrown Bell off his even keel. Even as he does all he can to try and keep the Mosses from the clutches of the mysterious killer, his world-weary eyes glaze over at the pointlessness of it all. Kids, there is nothing I can say about this film that isn’t praise. There’s simply nothing wrong with it. Not a false step anywhere. The story structure of the three men each pursuing the other and the effect that each has on the other in cataclysmic ways is stunning. They are a human representation of the Id, Ego and Super-Ego and result of the loss of balance between the three. For Moss’s theft of the money, his penance – being relentlessly pursued by Chigurh - is swift, extreme and far-reaching, but one has to ask who wouldn’t have taken the suitcase in the same position? Chigurh’s sociopathy lies in his complete belief that in his ability to kill better than anyone else, he is, in effect, an angel of death; and as such his very presence before the victim of a contract or an unfortunate coin-toss bestows upon him the right of life and death over that person. One can’t help but admire the single-minded purity that makes this nut job tick. More praise to the deft direction of the Coens that while Chigurh is one of the most compelling and frightening villains ever filmed, they chose not to make him the least bit sympathetic. The scenes of Chigurh’s pursuit of Moss throughout Texas and into Mexico are nail-biting stuff. The background music is spare and the sound effects are remarkable: Every step of Chigurh’s cowboy boot along a wooden stairway, closing in on Moss will lose you some fingernails and the gun battles are heart stopping. This movie employs silence as another cast member. Yet for all the thrills and existential gravitas, No Country for Old Men has tremendous wit. The dialog, while spare is sharp and full of common sense sass. Moss’s inner conversations engender hilarious responses and much of Chigurh’s over the top violence is peppered with the blackest of humour. Special note must go to the breathtaking cinematography of No Country for Old Men. Coen brothers’ standby Roger Deakins’ beautiful west Texas landscapes are the stuff of John Ford films and O’Keeffe palettes. Simultaneously lush and desolate, these backgrounds provide a great visual cue to the mindsets of both Sheriff Bell and Llewelyn Moss. The nighttime photography as the protagonists chase each other from street to street and hotel to hotel is vibrant, textural and malevolent; a natural backdrop for most of Chigurh’s best works. The daytime photography in the small, picturesque Texas towns gives one the feeling of life caught in another time – which indeed it is. Another sheriff moans to Bell how he never thought he’d see young people with “green hair, bones in their noses” walking through his town. 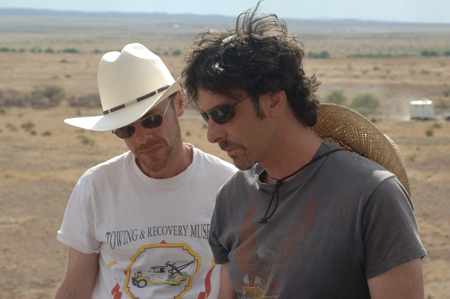 And in the pastel coloured world Deakins shows us, you can understand his bewilderment. Clearly, the performance in No Country for Old Men that will garner the most attention will be Javier Bardem’s as Chigurh. His completely measured performance is brave and original. He scared the trunk off of me, just staring out from under that Prince Valiant coif with dead shark eyes and a Mona Lisa smile on his face. However, I walked out of the film with Josh Brolin’s turn as the solid and stoic Moss lingering in my mind for days. His character epitomises the old maxim “still waters run deep”, as he does all he can to keep his family safe and tries to provide a better life for them. When finally pushed against the wall and made to fight for his life does the impassive Texan reveal that he’s no pushover and nor does his silence equal unintelligence. Brolin has to create Moss verbally with a series of grunts and precious few gravel-throated lines, using his face to convey what’s going on inside the hunted man. You’re with him every step of the way. I believe it’s an award-winning performance. On a personal note I'm glad to see Josh Brolin coming into his own as an actor, but then again, Goonies never say die! Tommy Lee Jones is the anchor of No Country for Old Men, and I wouldn’t be the least bit shocked if he walked away with the little gold man as well. The face with more lines than a Texas road map the cowboy hat on at the right angle, Sheriff Bell is a role Jones was born to play. The look in Jones’s eyes of mournful longing and bewilderment for a world gone by says more than reams of dialogue ever could. He strikes the perfect balance of sanity in the maelstrom created by the war between Moss and Chigurh. There is a remarkable scene toward the end of the film where Bell visits his paraplegic uncle, Ellis (- a remarkable moment for Barry Corbin) himself a former Deputy Sheriff and lays out his doubts and despair, and that scene nails down everything that’s come before. Oscar-winning just you wait. Kelly MacDonald does her best work here as Carla Jean the sweet, trusting wife of Llewelyn Moss. I haven’t been mad for anything she’s been in since Trainspotting but she really nails the role right down to the accent. (- In a press conference, MacDonald was asked how she got the West Texas accent so perfectly and she said “I’m from Glasgow, Texas.”) Woody Harrelson has a small role here as another mercenary hired by the folks who want the suitcase back and he’s just great. He carries off the perfect level of tongue in cheek humour and intelligence as the lesser of two evil hitmen. No Country for Old Men is a triumph on every level. This is what I suppose is the Coen brothers version of a crossover or “commercial” film and it achieves great success on that level with its action and thrills, while making no compromise to the integrity of their writing, their ability to direct unparalleled performances or their unique vision.